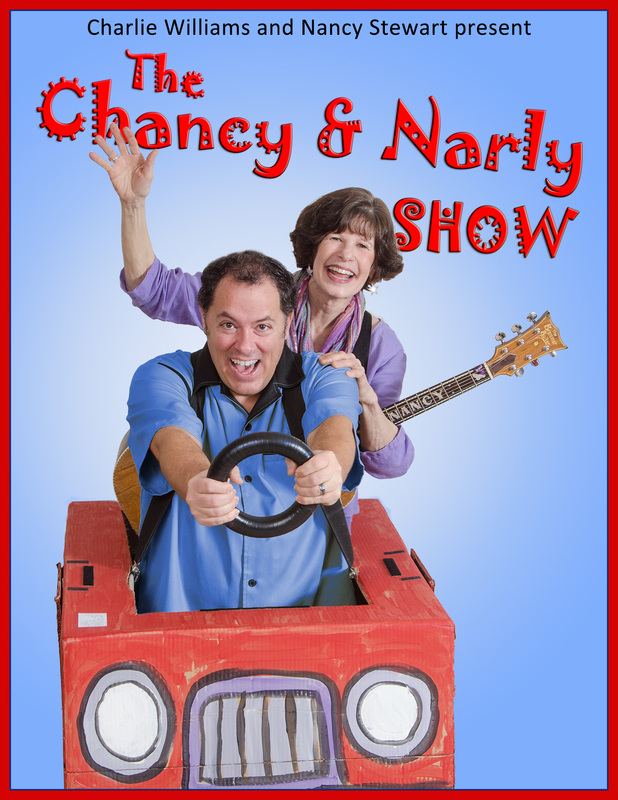 The Chancy and Narly Show! What happens when sweet songs meet nutty noises? 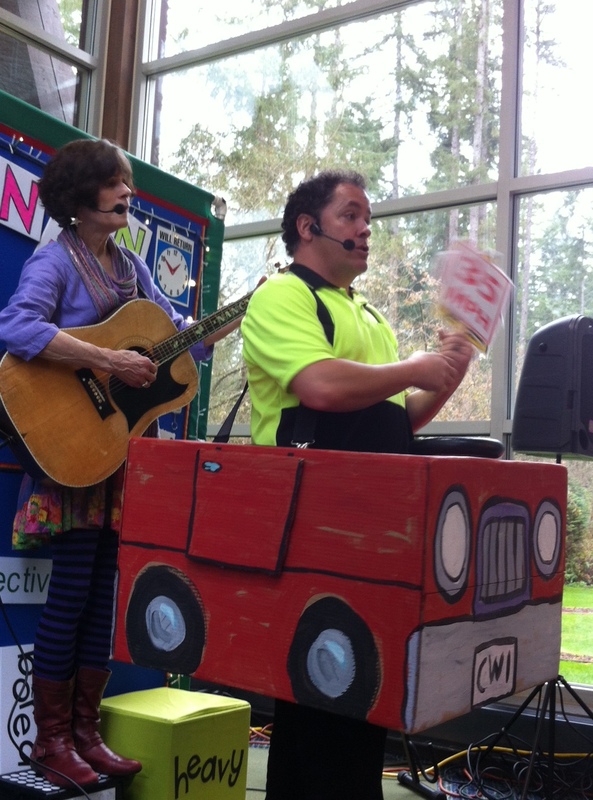 Get ready for a wild ride as two of the Northwest’s favorite children’s performers team up for phonetic fun at your local library! Bill Grogan’s Goat. The Itsy Bitsy Spider. Rockin Robin. SEE what Momma don’t allow in the library! 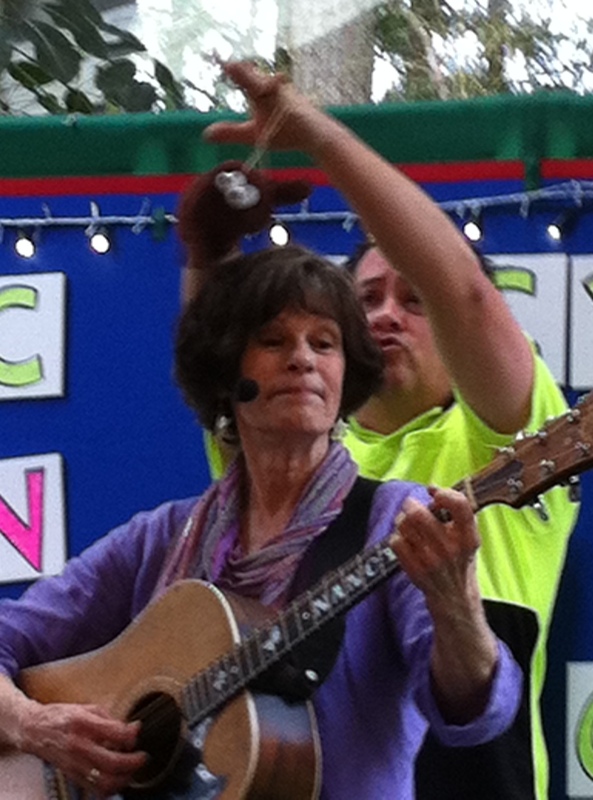 WATCH as Nancy SINGS and Charlie ZINGS! Have fun singing along and learn some noises for your music too! The science of sound from a motor mouth at Mach 1! ……….Talk about your accelerated reader! Heeeyooooh! What is a sonic boom? Why can’t I hear a dog whistle? What was the first human invention to break the sound barrier? Did dinosaurs break the sound barrier? How do we humans mimic sound? These questions and many more will be answered by the Noiseguy as we explore the science of how sound is produced in Nature and by humans! Fun with amplified sound, a kid with lots of seniority, also an attention hound. During this noisy show there will be sound wordplay where we look at words that imitate the sounds they represent, such as hiss, boom, growl, and chirp. This onomatopoeia enriches language, allowing us to capture sound in writing. We will discuss and pick the top 10 noises we love and hate. Participants will help select the sounds, and categorize them. An imagination improv! Watch a 2 minute fairy tale performed JUST using sound. We’ll also explore how sound is produced, like a boom of a thunderclap. We’ll discover how sound travels using vibration and sound waves. Of course Noiseguy will do the wave-thing with the slinky. See how a microphone can make you LOUDER! Eat yer heart out, Dewey Decibel! We’ll even use our voices as a sound effect instrument! Kids will learn some funny new noises to imitate for their spoken reading. They will leave with a new appreciation for the world of sound around them. BEING NOISY IN THE LIBRARY! 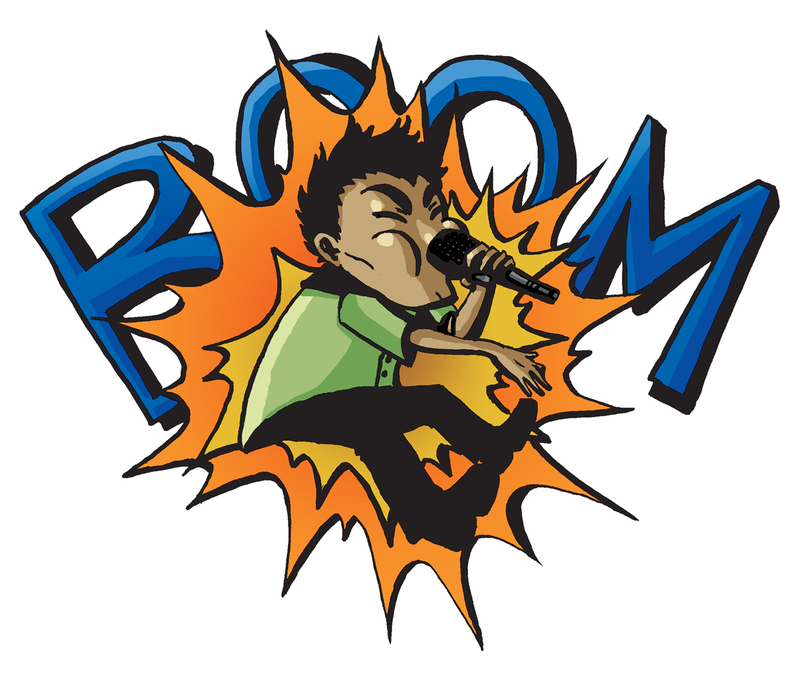 ……..Or how bout this fer a tag..
What is a sonic boom? Why can’t I hear a dog whistle? What was the first human invention to break the sound barrier? Did dinosaurs break the sound barrier? How do we humans mimic sound? What’s with all the questions? Why does everything have to have so much educational content? Are we really worried that during the Summer months, kids get stupider? Maybe they should get NO breaks at all! Let’s take away recess, it’s non-productive. Gotta keep those kids busy 24/7! Burn ’em out early, so they get that mid-life crisis over with by the 7th grade. Oops, wow, bunny trail. Lemme start over. Here’s a blurb for Stooooooooooooooorytelling! Listen and learn as language, loudness and laughter take the lead in the library. See that? It’s called Alliteration. During this noisy show there will be sound wordplay where we look at words that imitate the sounds they represent, such as hiss, boom, growl, and chirp. 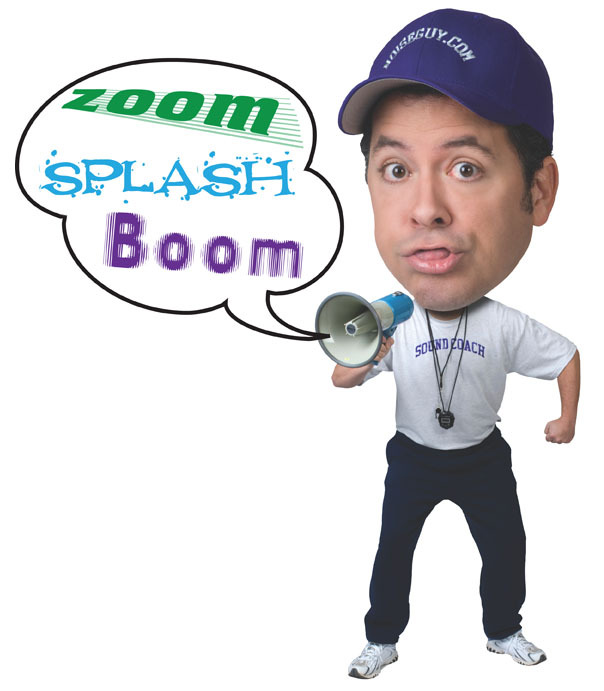 This onomatopoeia enriches language, allowing us to capture sound in writing. We will discuss and pick the top 10 noises we love and hate. Oops! Sorry, “hate” is a hate word. Let me say “dislike.” Anyway, kids will help select the sounds, an exercise in improv and imagination. Theodor Seuss Geisel was an American writer, poet, and cartoonist most widely known for children’s picture books written and illustrated as Dr. Seuss. His birthday is March 2, 1904 and that week has come to be known as “Read Across America” week! One of my favorite Dr Suess books from my childhood was Mr. Brown Can Moo, Can You? It inspires kids to be noisy when they read. 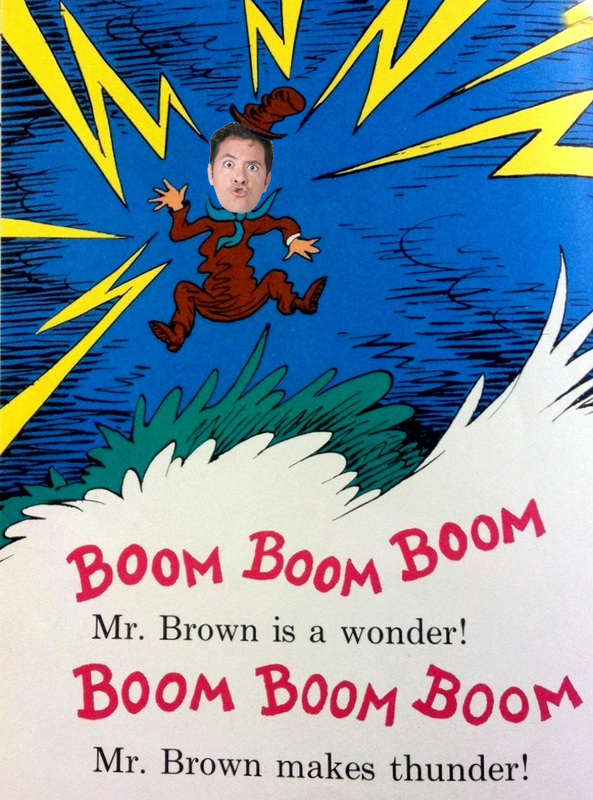 To celebrate the event I will do a dramatic reading of Mr. Brown and kids will get to join in! Then it’s “Celebrity Storytime Showcase!” Where I read samples of his other classics as various celebrities. Like “The Cat in the Hat” as Samuel L Jackson. “Green Eggs and Ham” mumbled like Garrison Keillor. “If I Ran the Circus” by Batman. “Hop on Pop” as Jabba the Hut. It’s kinda like Book-drop Bingo. And of Course Mr Brown can Moo as ME!!! Noisy, rhyming fun for every, every everyone. 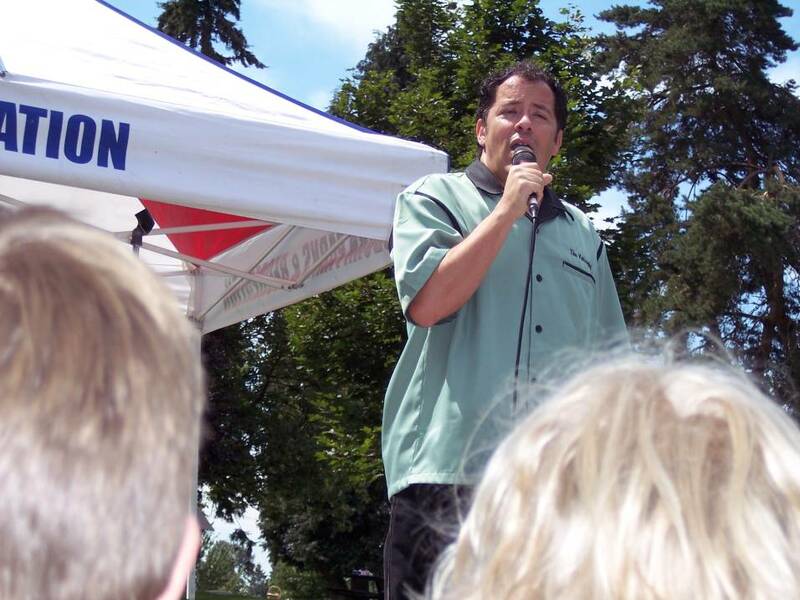 Charlie Williams is a vocal sound impressionist, author and kids’ comedian from Seattle, Washington. Hear creaking doors and squeaking floors. 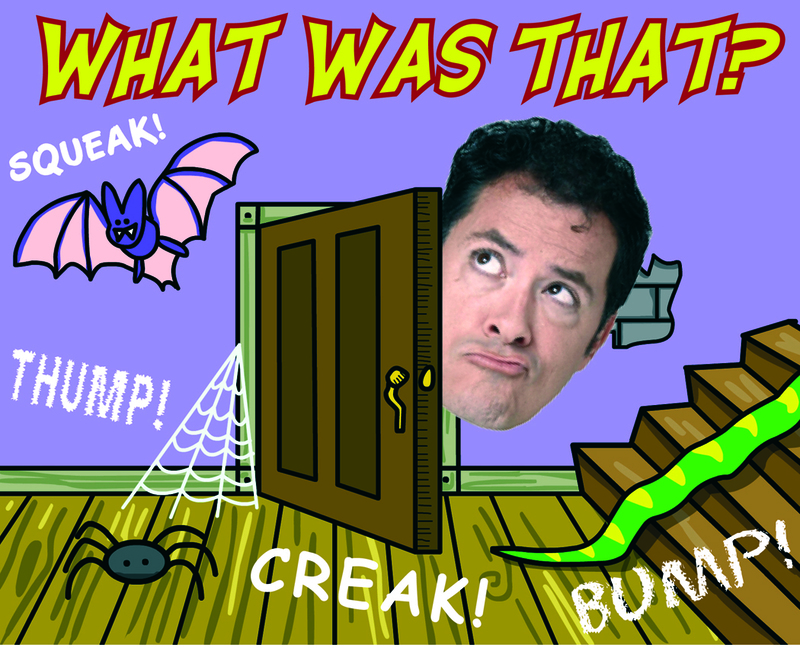 Hear bumps and thumps and learn how to make scary noises for yourself! Good pranky fun for the whole family! (verb) 1. to imitate or copy in action, speech, etc., often playfully or derisively. to imitate (a person, a manner, etc), esp for satirical effect; to ape. 2. a person or animal who mimics, especially a performer or parrot skilled in mimicking others. Synonym: mock; impersonate; simulate, resemble. Performer? Parrot? Ape? Mock? Now we got a show!! 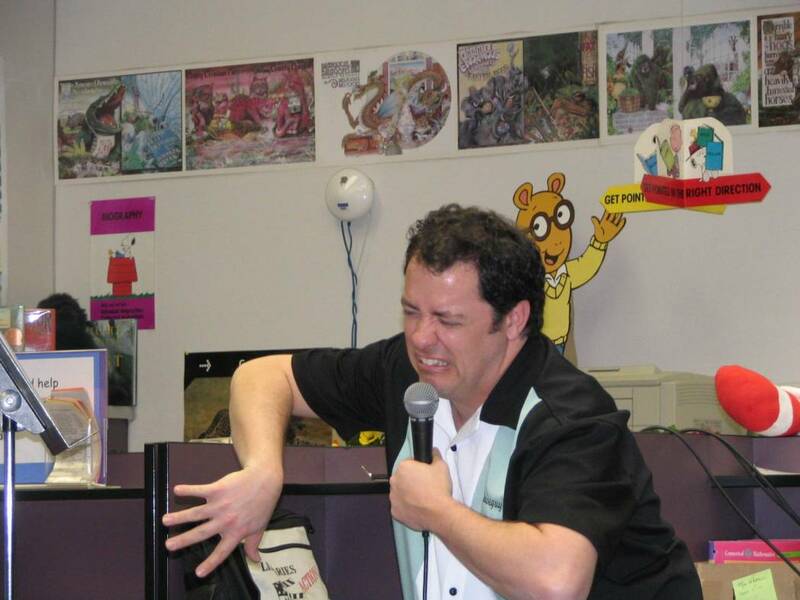 Charlie the Noiseguy presents a show full of impressions, where kids and their families will laugh and learn to make noise and voice imitations, and how to put them into reading, writing, speech and best-of-all…. PRANKS! We start off discussing what a mimic is and why he does it. Then we go into people/celebrity impersonations, accents and speech patterns. Then we discuss onomatopoeia (which is how we break down and “speak” the noises) and then cover an A-Z noise list. Finally we act out body animation and facial expressions, then put the sarcasm disclaimer in- how not to get in trouble with it, or taking it “too far”! Ha ha! Sounds are all around us, everywhere, everyday. Charlie is a human parrot capable of imitation and mocking! Hear planes, trains and automobiles, flushes, shushes and sneezes! 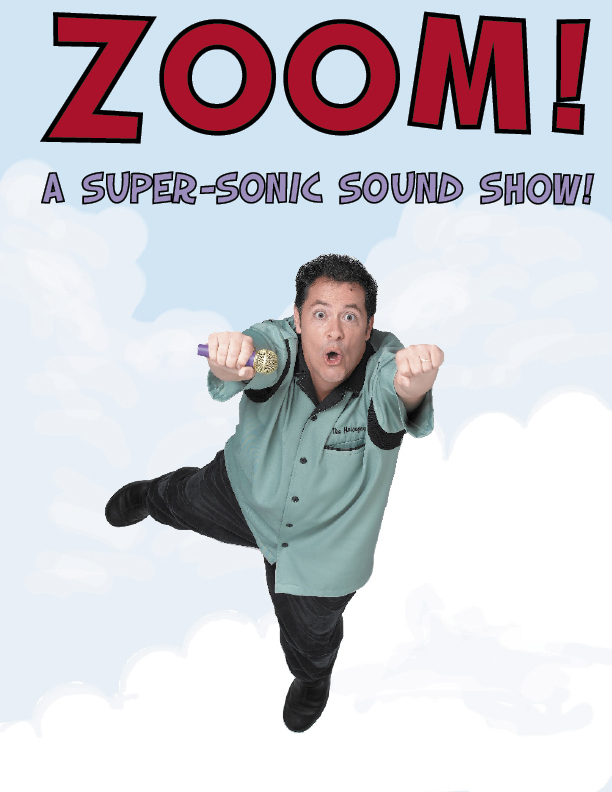 Noisy fun from a guy with a doctorate in Onomatopoeia! You won’t believe your ears! A mimic can also take a nice picture and make fun of it too! How to make your own storytime sound effects. Intended for children’s librarians, teachers, educators and storytellers. 60-90 minute activity workshop & slideshow with handouts provided. Sound Coach is also a story show off the shelves of Charlie’s imagination. In this hands-on, tongue in cheek workshop, participants will learn the basics of making sounds for story times and other presentations. He will teach how to make noises of animals, machines, music and vehicles. The audience will learn about thematic values such as ambiance sounds and also how to vary your voices to enhance any public presentation. Start a spooky story with a squeaky door! Read “I Stink” with realistic garbage truck sounds! From chirps to explosions. From chainsaws to roars. We will learn an easy step-by-step procedure for imitating everyday sounds. Learn 12 noises you already know how to make! See the history of sound in comic books and movies! Be instructed on how to take care of your throat before and after your storytimes! Practice voice warm-ups and strengthening techniques! 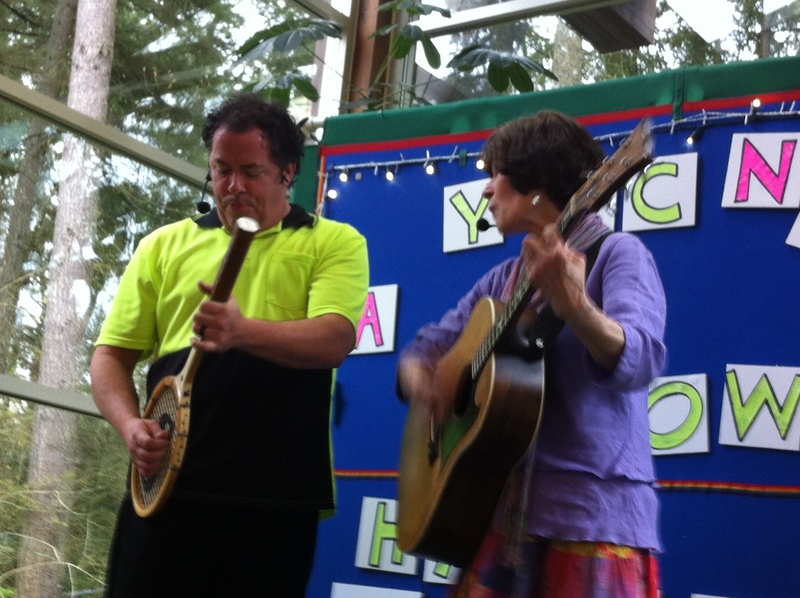 Participate in a whistling workshop! Topics also include onomatopoeia in reading, writing and speech. Idea development, journal writing, practice spots and evil pranks. We will focus on listening to the world around you and imitating it. ….OK, it’s also good “end of the conference” comic relief. AV requirements: LCD projector and screen. He can present with or without a mic depending on audience size. He has a nice sound system of his own, but if he is flying in, you’ll have to provide one. No clip on mics, please! The slobber shorts them out! Where has he done this? SOUND. Just the Sounds. Every imitation in the book, thrown out on his Shure 57. No educational content. Just a haywire Noiseguy running amok. Hang onto your ears and your sanity. Lots of fun for everyone! Funny sounds, imaginary objects, fractured fairy tales, kid comedy and sound shenanigans! 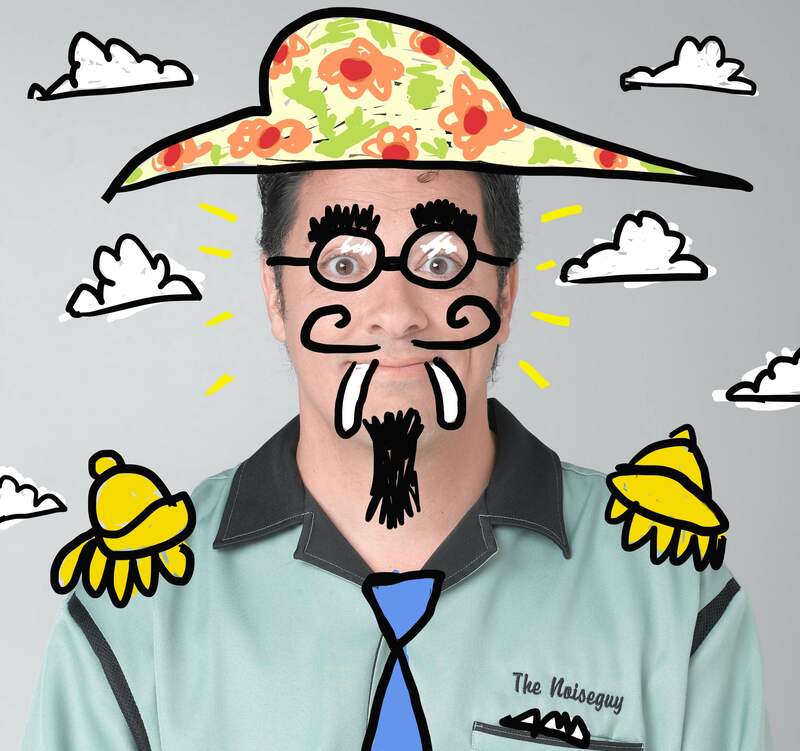 Watch as the Noiseguy makes hundreds of noise imitations in a wild and crazy show! Like Noisy Tales, except with more hyperactivity. It’s Sugar Frosted Noisy Tales and Kid Comedy available for Boy Scout Blue and Gold Banquets, Birthday Parties, Parks and Rec Entertainment, Malls, Festivals and Fairs! He can set up anywhere that a crowd can gather. Planning a family fun night? Let Charlie be your entertainment. He’ll do a little bit of everything, stories from childhood, rambunctious readings, noisy fun for everyone. 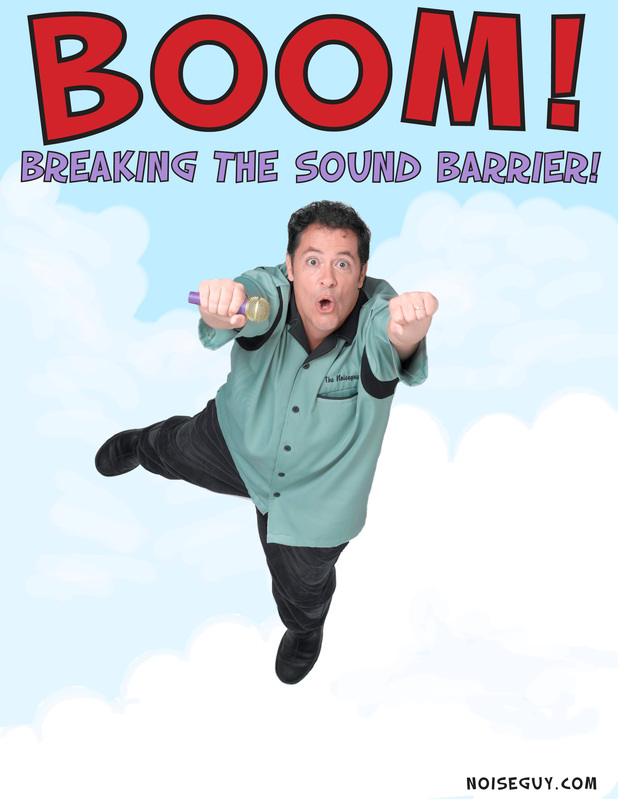 And of course tons of comedy sound effects! It’s a blast for ALL ages! This is a good show to tie up a day of assemblies with Charlie. Parents will be wondering why the kids are imitating disco chickens and ninja beavers. They’ll come to the Family Fun Night looking for answers….. oh and they’ll get ’em! They’ll find laughter is the best medicine, especially during these crazy dollar days. Also…. humor is an excellent source of mental fiber. In 1979, Charlie was using noises in school…. for evil! Yes, he could imitate a drip to drive the teacher crazy. He could imitate the school belltone and dismiss class early. But he had to learn how to take a talent that put him in the principal’s office and do something productive with it. Yes, you can indeed make a career out of ANYTHING. His message of hope reaches “C” students (just like him) everywhere! Topics covered: Journal writing, creative writing, public speaking, humor as a life skill. Charlie’s favorite toy was a Mr. Microphone. You’ll see why he has so much fun with amplified sound!